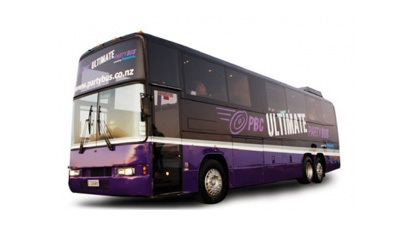 The Party Bus Company is so more than just your typical Auckland party bus company. They offer a range of options for your next hen or stag party and their experienced crew guarantee the ultimate in customer service that deliver unforgettable memories for that last night of freedom. When it comes to hen and stag parties you can’t go wrong the The Party Bus Company! With a fleet of over 25 vehicles including 4 fully licensed Party Buses, they also offer a range of corporate, themed events, midyear and Christmas parties at venues across Auckland. Creating amazing parties and events is what they do with a process that simplifies the ordeal of organising important events like a hen or stag night. So if you’re looking for an Auckland party bus that delivers what they then you’ve come to the right place! Our Premium Party Bus is a fully licensed BYO Party Bus enabling you the ability to BYO wine, beer, & RTD’s! Specially designed social sideways seating offer our a great time and enjoy the experience. Suitable for up to 30 passengers the Premium Party Bus featured LED lighting, sound system and a personal host upon request. Our hen and stag packages party bus food, Auckland’s finest Allstar Stripper entertainers, great sounds & your own private venue. For the Ultimate experience we give you the Ultimate Party Bus suitable for either hen or stag party. Featuring 2 separate lounge areas separated by the central bar area, the Ultimate Party Bus is a fully licensed limo coach. This Party Bus also has an onboard toilet for your convenience! Party lighting, plasma screens and pumping sounds make it the ultimate night out! The VIPER is a fully licensed bar with exclusive executive bar at affordable prices. This Limo Lounge coach is a luxury lounge on wheels complete with three LED TV’s onboard for your viewing pleasure the option to have a personal host who will act as your DJ for the duration of your hen or stag party. 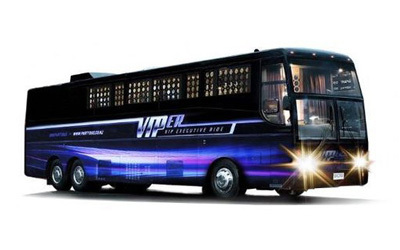 The VIPER party bus also features an onboard toilet with running water for convenience.